One of the most common group workouts involves gathering with friends and heading out into the open water for a swim. When the weather is warm, this can become a weekly ceremony where athletes just enjoy getting out in the open water. Most athletes will perform these sessions unstructured, with the focus being simple aerobic development and socializing. What these athletes are missing out on is a great opportunity to gain sport-specific skills for open-water swimming. This can easily be accomplished by giving the workout some structure. Here are some simple open-water drills and skills to practice the next time your group heads for the ocean, lake, river or even a lane-line-less pool. Start on the beach and run into the water. Count the steps from the time your foot first touches the water until the water becomes too deep to hold your speed and you must start swimming. Repeat this until you establish a consistent number of steps you can run before losing momentum. Now attack the water with the plan of diving forward to start your swim after that specific number of steps. This will maximize your momentum and speed, transferring it to your swim. If your upcoming race features a beach entry, this is a good drill to practice at that race's location, if possible. Doing so will allow you to familiarize yourself with the start and give you an edge on your competitors. With a partner, or with a small group of three or four, form a line and follow the feet of the swimmer in front you. Try to hold their draft as close as possible. If you're the leader, take about 40 or 50 strokes, then pull off and allow the swimmer behind you to rotate to the front. For fun, don't always swim in a straight line, forcing the drafters to pay attention. Practice your turns at a buoy, first solo, then progressing into small groups. Experiment with different approaches to the buoy—coming in for a wide turn or cutting the corner as tight as possible. Additionally, the angle of the corners can vary from race to race. Check the course map of your upcoming race to know what to expect. Make sure to practice both left and right turns, because just like we have dominant sides of our bodies, we have dominant and weak turning sides as well. Just adding some of these simple drill exercises in your open water swims can add variety and fun to your sessions, as well as build specific skills which can be used effectively on race day. Best of luck! 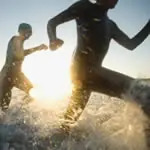 Find your next triathlon or swimming event. Jim Vance is a USAT Level 2 and Elite Coach for TrainingBible Coaching, and a professional triathlete. Questions or comments can be sent to jvance@trainingbible.com. You can also follow his writings and training advice at his coaching blog, CoachVance.blogspot.com.